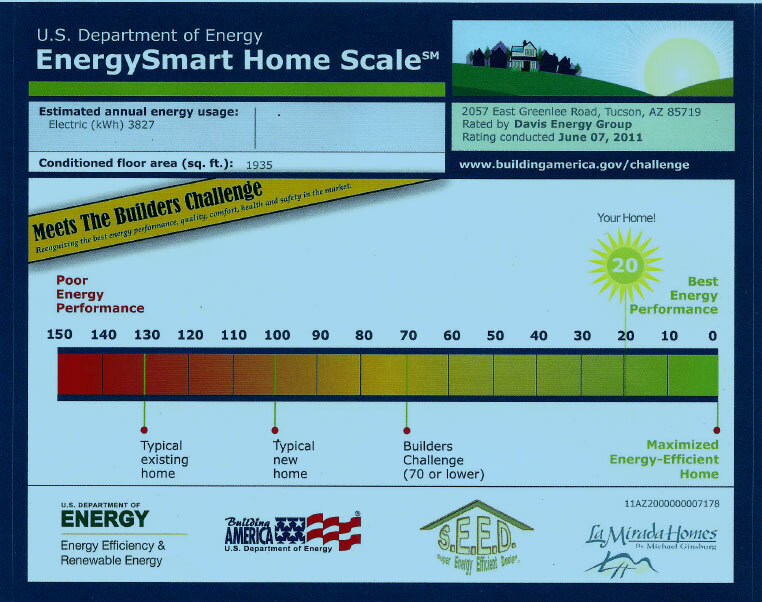 On June 7th, the DOE, Builders Challenge program issued its formal certification of the HERS (Home Energy Rating System) rating for The S.E.E.D. Home; it received an astounding rating of HERS 20! Very close to the holy grail of ‘0’. As it turns out, the only reason it did NOT receive a HERS ‘0’ is because the final rating category has to do with only the end user and how much electricity they might use for TVs, computers, game boys, hair dryers, etc., etc. However, it is my belief that anyone interested in an efficient home is going to be mindful of their energy use habits. That being said, I have no doubt that The S.E.E.D. Home performance in terms of electrical energy usage will in fact be a true net zero home. One of the most outstanding aspects is the RADIANT FLOOR COOLING performance. The reverse cycle chiller 2 ton heat pump operates ONLY between the hours of midnight and 7 am! That’s it. The floor is cooled to a comfortable 72 degrees with the corresponding air temp being 75 degrees. This reading is taken at 7am. By the end of the day the temperature rise is only 3 degrees, a corresponding 75 degree floor with a 78 degree air temperature! It is like being in a cave wherein the ENTIRE air space is a consistent and near constant temperature throughout every square foot of the home. There are NO hot or cold spots created by forced air movement from an air handler – just cool consistent temperatures throughout the day and night. Then at midnight, the compressor kicks in recooling the exposed aggregate concrete floor to 72 degrees and the cycle replays. This is turning into a cutting edge breakthrough with regard to cost effective high performance energy efficiency because the compressor ONLY operates in the early morning hours when the outside temps are coolest and therefore the heat pump can operate at its optimum efficiency. Additionally, there is NO cycling of the unit because it is preset to operate for these 7 hours ONLY; the system coasts the remainder of the day and night. The home is so well insulated and sealed that in Tucson’s current summer temperatures of 110 degrees there is ONLY a 3 degree rise for the entire day. And,remember, the temperature is constant and consistent (within the 3 degree spread) WITHOUT the intermittent cold air blasts from a forced air unit trying to mix with the existing warmed air (thus, no hot and cold areas). The S.E.E.D. Home receives the GOLD EVHA award!